Have you ever needed to add or remove money from your cash drawer? Be sure you know how to record this on your Change Register with this simple procedure. That way, you'll end up with fewer discrepancies at the end of the session. See how it works with the following example. You need $5 for a milk run. 1. Start by removing money from your Change Register. Tap "Drawer," then choose a till, and tap "Add/Remove Money." Now enter how much money you're removing and tap "NEXT" on the keyboard. 2. Enter a reason. For example, "Milk run." 3. 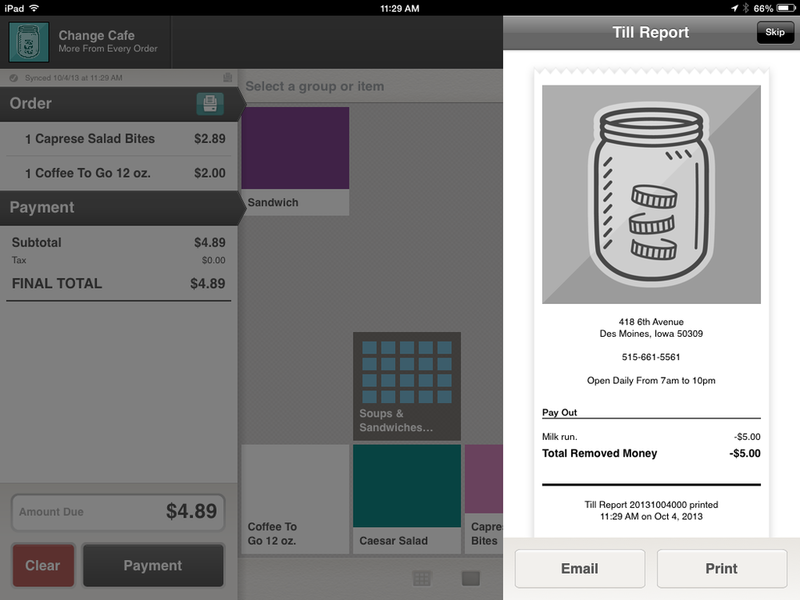 Now print a till report and add it to your cash drawer. 4. Add any change back to your Change Register. Let's say you have some cash leftover from the milk run. When adding it back to the cash drawer, also add it back to your Change Register. Just tap "Drawer," choose a till, and tap "Add/Remove Money." Enter how much money you're adding back, and tap "NEXT." Type in a reason, for example, "Change milk run." Then print that till report and add it to the drawer with the cash. Chat with us live at change.io, email us at hello@change.io, or give us a ring at 515-661-5561.